and for several years, the chain's decorations actually exploited that. The chain was founded in 1957; a lone restaurant remains, in Santa Barbara, CA. The only problem with that Sambo's in Santa Barbara... They don't serve dinner. The shop is closed at 3 PM. 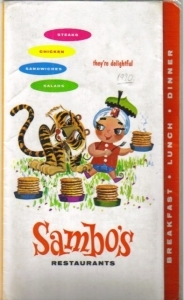 Gosh, I remember Sambo's. I had to look it up in Wikipedia and I see that some of the locations were sold to Denny's - which would explain the similarity of the two companies' signs. No wonder Denny's always made me think of...what was it?....oh yes! Sambo's! 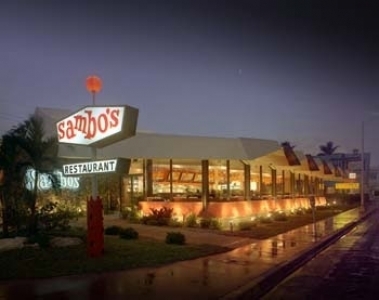 There was a Sambo's in Santa Clara, CA when I moved there in 1975. If I recall correctly, it was on the south side of El Camino Real just west of Lawrence Expressway (or was it just west of Kiely Blvd?). I thought their pancakes were pretty good.